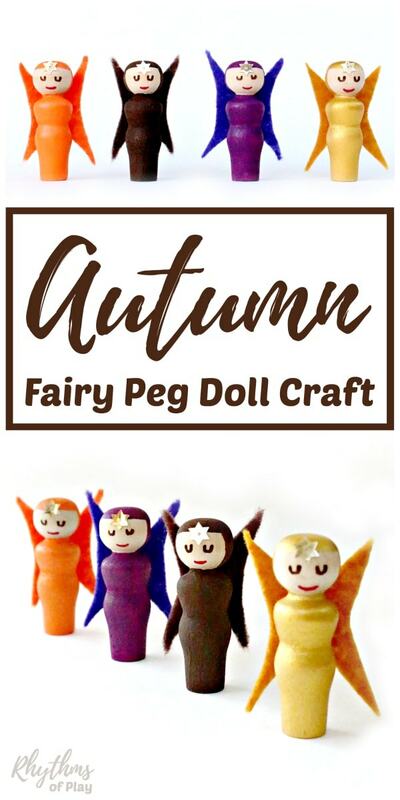 Fall fairy peg dolls are a fairy craft and DIY toy for kids. These cute little DIY fairy peg dolls are an easy homemade gift idea for children. Fall fairies also make cute DIY home decor. They add a touch of autumn to your home when displayed on windowsills, mantles, shelves, nature tables and in fairy gardens. These little autumn fairy dolls are also perfect for pretend play. My daughter hasn’t stopped playing with them since we made them. She loves to fly them around the house and play with them in our fairy garden. We have even made a few painted rock fairy houses for them. Click on the link to learn how to make your own! We have also made a set of winter fairies and will be making spring and summer fairies soon… stay tuned for more fairy fun! 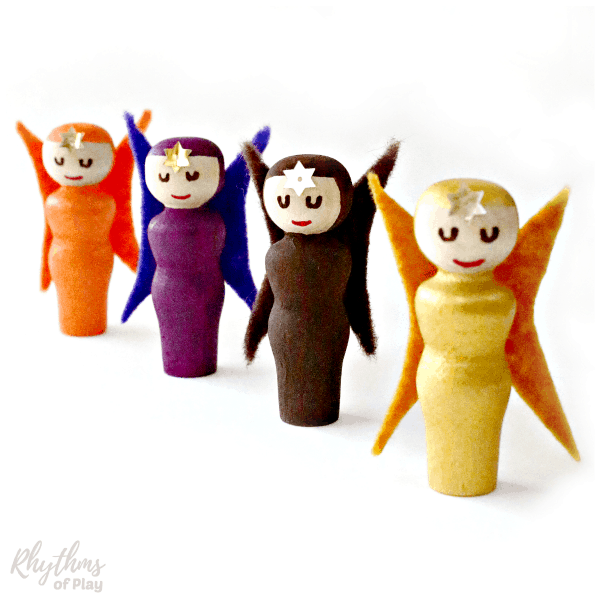 Wooden peg dolls – There are more wooden peg dolls in this set than you will need for this fairy craft. Check out all of our other peg doll DIY toy ideas for kids at the bottom of this post. Paint pens – Or you can use this incredible nib dipped in paint. Sewing scissors – Sharp scissors make it easy to cut felt. Read through the entire directions before you start making this fairy craft. Also, see the step by step fall fairy peg doll photo tutorial that follows the written instructions. Use fall acrylic paint colors of your choice to paint the fairy peg doll bodies. If you are allowing a younger child to help you make this fairy craft, tape off the heads with painters tape to protect them. Look at the head of your fairy peg doll and decide which part you want to be the face. Paint a line from shoulder to shoulder. Don’t worry if it’s messy. Paint the back of the peg doll head. Square off the head by painting across the forehead of the wooden peg doll. Touch up and/or paint the neck of the peg doll and any other areas that need cleaning up around the face. Use a red paint pen to paint a simple upturned line for a mouth. Mark 2 sets of 2 dots with a brown or black paint pen to create the eyes for your fairy craft. Connect each set of 2 dots with a U to make the eyes for each fairy. Alternatively, you can make dots for eyes. Check out this angel peg doll and our DIY Rainbow Peg Dolls if you would like to learn how to paint a slightly different face on your peg dolls. Use foam a brush to apply Mod Podge to the entire doll if you would like to seal and protect it. Mod Podge goes on white and dries clear. Fold felt rectangle in half lengthwise. Mark off a 1/2-inch section in the middle. Cut from top mark to top opposite corner, and from bottom mark to bottom opposite corner. Open wings and place thumb in the middle. Make the wing curve in by cutting from the bottom corner in toward thumb. Once you reach the middle cut away from thumb toward the top corner. Repeat on the other side. 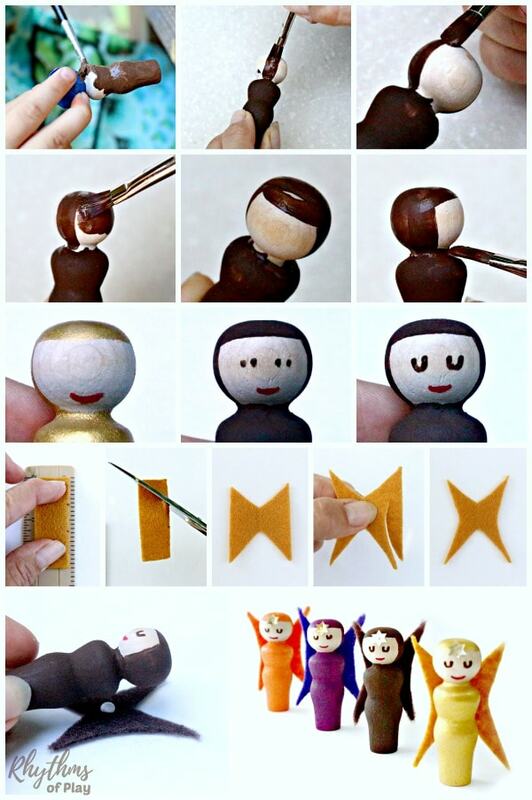 Place peg dolls upper back on the glue. Glue a star sequin to the middle of each fairy’s forehead if desired. They end up falling off and are not really practical for play, but it does add a special little sparkle to this fairy craft. 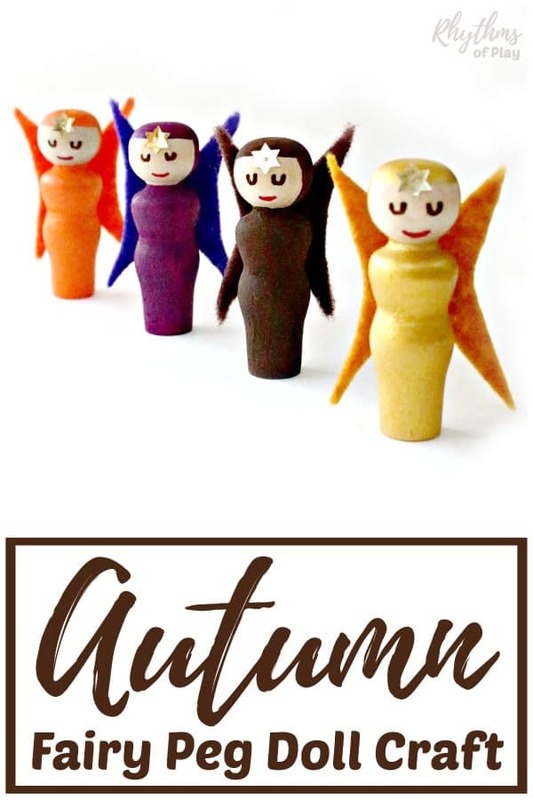 These cute little fall peg doll fairies are surprisingly easy to make. All you need is a few simple materials and a spare hour to make this sweet fairy craft. Fall fairy peg dolls are an easy fairy craft and DIY toy for Kids. 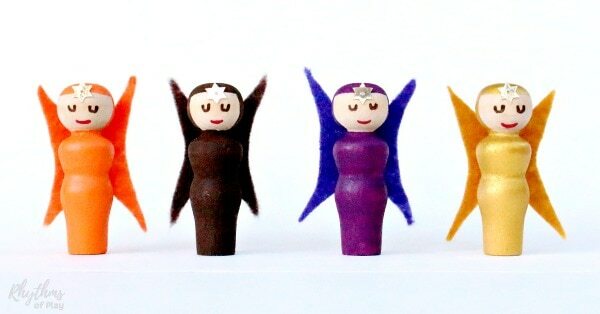 Fairy peg dolls make a lovely handmade gift idea. Children love to use these cute little fairy peg dolls for pretend or imaginative dramatic play. Fall fairies also make simple DIY home decor. Fall fairy peg dolls look so cute when displayed on mantles, shelves, nature tables and in fairy gardens! For more fall fun be sure to check out our fall bucket list for the best autumn EVER! If you purchase wooden peg dolls to make these autumn fairy peg dolls, you will have enough left to make a few more of these wooden DIY toy ideas for kids! I love how easy these instructions are for someone who isn’t naturally crafty!